Hey there! Thanks for dropping by Seeing the FOSS! Take a look around and grab the RSS feed to stay updated. See you around! 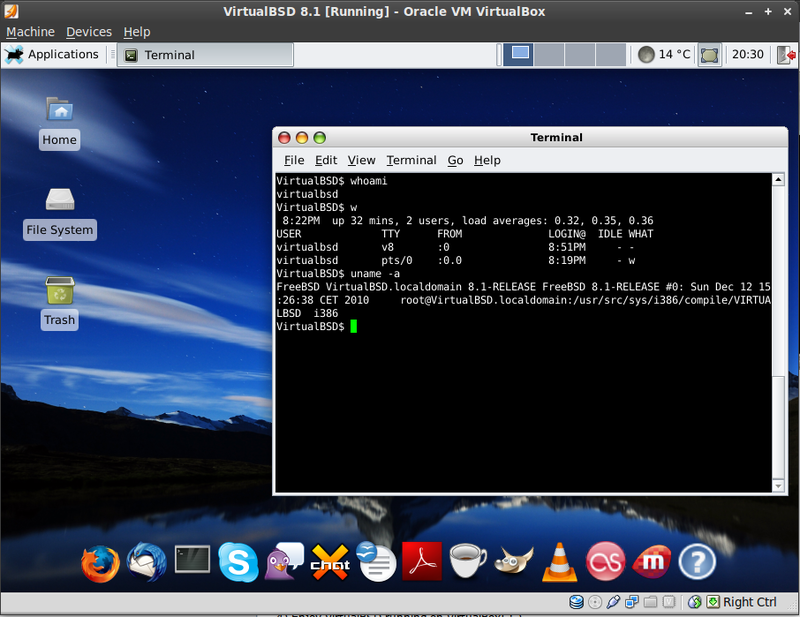 VirtualBSD is a FreeBSD 8.1 desktop installation, packaged as VMware appliance. Go check their website out. Now, being more familiar with VirtualBox than VMware, I decided to take the bit more complicated installation decribed here. I’m delighted to report that everything works as a charm out of the box. My VirtualBox installation is the Oracle proprietary one (not virtualbox-ose) at version 3.2.12 straight out of their ubuntu ppa. Host system is as always my Linux Mint 9 (which is based on Ubuntu 10.4). I personally didn’t like the way the .vmdk is split in the VirtualBSD folder. No problem there, just register the main .vmdk in Virtual Media Manager beforehand, and clone it using “VBoxManage clonehd” to a new file. Then discard the whole folder and just use the new file instead. The UUID of the virtual hard disk changes with this process, but it’s no problem because internally, VirtualBSD doesn’t hardcode UUIDs in it’s /etc/fstab like some linux distros do. I also changed the Network parameters in VirtualBox to “Bridged adapter” instead of “NAT”. VirtualBSD’s networking was smart enough to configure its IP via DHCP. Great! What the vmware2vbox script does is first uninstall any VMware specific software, then install virtualbox-ose Guest Additions. Now, since I’m not using virtualbox-ose, that is not optimal, but everything seems to be in order (with maybe USB missing, but untested). Removing that and installing the right GuestAdditions is still a work in progress which I reserve for when I’m more acquainted with FreeBSD internals (lazy). Recording studio hardware: I still rock!